The dramatic hit film THE DEPARTED gives an unflinching look at double lives in the worlds of law enforcement and crime as portrayed by moles Colin [Matt Damon] and Billy [Leonardo DiCaprio]. Each man becomes consumed by his double life, gathering information about the plans and counter-plans of the operation he has penetrated. But when it becomes clear to both the gangsters, led by crime boss Frank Costello [Jack Nicholson], and the police that they have a mole in their midst, Billy and Colin find themselves in constant danger of being caught and exposed to the enemy. Each must race to uncover the identity of the other man in time to save himself. SET DECOR spoke with Set Decorator Leslie Rollins SDSA about the creation of this uncompromising film. 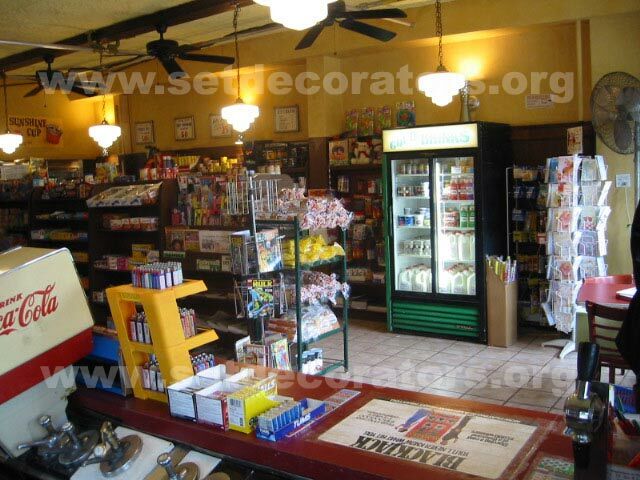 SET DECOR: How did the sets offer visual hints to the “collision course” Scorcese mentions? Set Decorator Leslie E Rollins SDSA: When I first read the script it was obvious that Colin and Billy were living parallel lives that would ultimately intersect. However, Colin being the ambitious striver that he is and Billy being the virtually homeless outsider, have little in common. What I found more fascinating than their commonalities were their differences. Colin seeks a life in the glow of the golden dome of Beacon Hill, living the good life with wealthy people. Billy simply wants stability and a home. One of the most poignant elements of the story is the fact that Billy sleeps on the sofa in his dead mother’s nearly empty and haunted living room. Colin has surrounded himself with the trappings of the upwardly mobile life while Billy is desperately trying to connect to some element of his past. At one point in the story Colin’s life has closed in around him, his apartment filled up with the possessions of both his and his new wife Madolyn’s lives, while Billy’s world is almost empty. Later, after Madolyn comes to her senses and leaves Colin, both men live in what amount to haunted houses. SD: Colin, Billy and Costello are all multi-layered and complex personalities. How did you reflect these complexities in their living quarters? LR: Interestingly, Billy’s private world is represented almost exclusively through the lens of his mother’s life. Having married his father against her wealthy family’s wishes and cast out, she mother raised Billy in a small, elegant house furnished with a few old family antiques. The majority of these have now been sold or claimed by other family members. It is in this nearly empty house that Billy camps out, surrounded by the few pieces left from his mother’s past Brahmin life. Colin desires everything that he feels is his due: all the trappings of Costello’s world. The big difference is that Colin’s choices are bereft of Costello’s complex character. Colin does not want any trace of his origins in Southie to show through. As a result, his furniture, art and music are almost soulless. We used slick, shiny surfaces, hard edges and black, grey, colorless fabrics to furnish his expensive but banal high-rise co-op apartment. In contrast, Costello’s world is soft, warm and worn, reflecting his all powerful, confident character. Nicholson portrayed Costello as an art collector, cook and wine connoisseur. He envisioned Costello as a painter, so I created an area near the expansive windows overlooking Boston harbor that functioned as a sort of casual atelier. Because Marty wanted Costello to have a fine library, I provided an extensive and carefully selected collection of rare and first editions by Irish authors. I gave him an interest in race horses and, of course, women. Danica Derpic of D2 provided fantastic nudes in almost every medium from drawings and oils to sculpture. Costello’s world is one of luxury and indulgence. 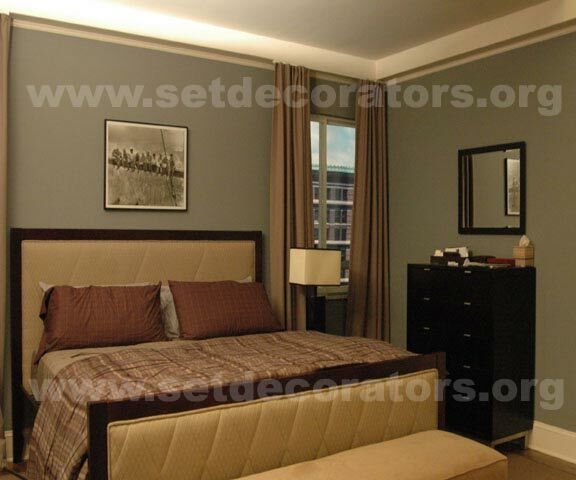 The apartment location chosen for him was the top floor of a high rise overlooking Boston Harbor. The apartment was smaller than Marty would have liked, so we had to play all sorts of visual tricks to make it seem larger and more luxurious. Production Designer Kristi Zea put mirror reveals on the windows to increase the apparent width of the view. I used silver leaf on the ceiling coffers and extensive indirect and down lighting to expand the room. The apartment really came to life in the night shots when we were able to take full advantage of the lighting we’d installed. As shooting went on, however, we found out that Nicholson does not like to work nights. Many of the night shots were moved to daytime, so we lost some of the shadowy mystery we’d been striving for. We also concentrated on an interplay of sumptuous textures. I chose mohair, silk, leather and wools for upholstery and floor coverings. We had a solid acrylic coffee table and replicas of the Normandie Grille Room chairs custom made. We based the chairs on photos from the original publicity materials for the art deco ocean liner. There was a definite feeling of luxury in the apartment even though it was very small. My original image was of a dark, womblike monochromatic space. We did manage to stay fairly true to that spirit. SD: Did Nicholson’s perspective add an appreciative dimension to your set dressing? LR: Jack most definitely impacted our choices. I had always regarded the character of Costello as a renaissance man, debauched and immoral though he might be. It was Jack’s idea that Costello was a painter which led to a revision in our choices of art throughout. The greatest impact was a new scene with two hookers that he added to illuminate Costello’s debauched and perverted character. We ended up building a very elaborate 3-wall bedroom set on stage in New York that needed to appear to be in the apartment in Boston. Jack had a clear idea of what he wanted. We covered the walls in blue crushed velvet, topped the windows with gilt valances, hung heavy silk brocade drapery and gave him an enormous over-the-top bed. I prepared a portfolio of art for him to select from. The overall effect was very “pimpstyle” and worked amazingly well. I am a firm believer that actors know better than anyone what their characters like and don’t like. Given the opportunity I always welcome actor input. Most of the time, I wish they had more to say about their character’s environments. I don’t understand why there is not an accepted avenue of communication between the set decorator and the actors. As far as I’m concerned we always benefit from actor input. SD: Thomas B Duffy, a 30-year veteran of the Massachusetts State Police served as a technical consultant for the film. Did you have the benefit of Duffy’s expertise? LR: Tom was fantastic. He quickly grasped the relationships between all the players and departments and learned to communicate in a unique way with each of us. 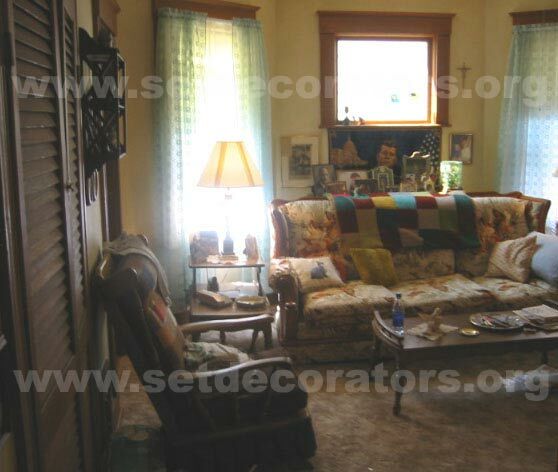 It is always surprising to novice technical advisors what will interest the set decorator. We want to know as much about what is in their trash cans as what is on their walls. Tom got pretty good at thoroughly answering questions. After the first couple of weeks, he began writing well-researched responses on each issue. One of the most important contributions he made was to invite my long time assistant Christine Moosher SDSA and me to MSPHQ for several days of interviews and tours. Many of the troopers, detectives and secretaries were indispensable in providing insider knowledge and sources. We were invited into a number of trooper’s homes for invaluable first hand observation. Christine was even able to get copies of actual forms, awards and photos that we then reproduced. We invited Tom to the set several times for in-progress walk-throughs so he could point out any thing he felt was false or inaccurate. 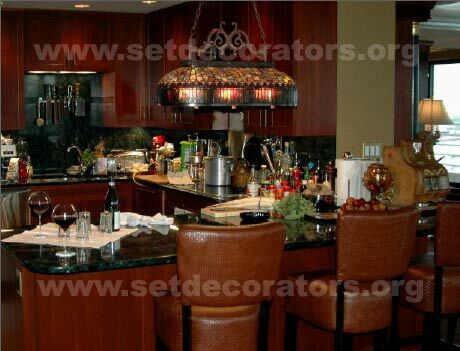 He was very happy with the final result and impressed with the lengths set decorators go to for accuracy. 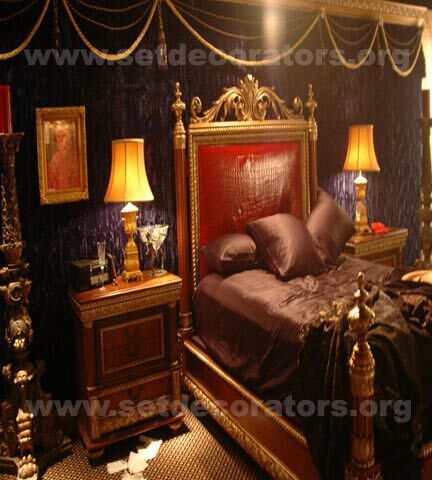 Tell us about how this noiresque theme affected your decisions and decoration. LR: There is a shadowy world hidden behind the doors to our squad room. The original interiors on which our set was based were lit almost exclusively with fluorescents. The ceiling system that Kristi designed had built-in lighting grids for which I had over 300 metal diffusers made. Then when Michael made the decision to light the set exclusively with down lights, those diffusers became masks for the lighting grid above. It actually worked out perfectly. Our color palette was limited from the beginning: Grey, brown, and blue accented with hard metallic chrome and bronze anodized aluminum. The set is almost colorless. It is a very chilling effect. SD: You worked with Production Designer Kristi Zea on THE MANCHURIAN CANDIDATE, but this was your first experience working with Martin Scorcese as director. Was he collaborative with the whole crew? Or did he work most closely with his lieutenants and stay focused more on the acting and camerawork? LR: Marty is very focused on the actors. He limits the number of people in his circle to minimize distractions. This makes our job very challenging. When he walks onto a set, he knows exactly what is right and what feels false. He may not know (or care to know) every detail of the reality of police procedure, but he understands human nature. In the end this is far more important than knowing the details of a cop’s trophy case or closet. If I’ve done my job properly he shouldn’t ever have to worry about those technical matters. I thoroughly enjoy working with Kristi. She is one of the sunniest personalities I know. It’s funny that the two movies we have done together should be so dark! SD: What were some of your biggest hurdles? Our biggest hurdles were technical problems. With a cast as high-powered as this, there are bound to be scheduling conflicts and commitments to be honored. This required an almost continual rescheduling of work so that sets we thought we had weeks to prep suddenly got moved up to next Monday. 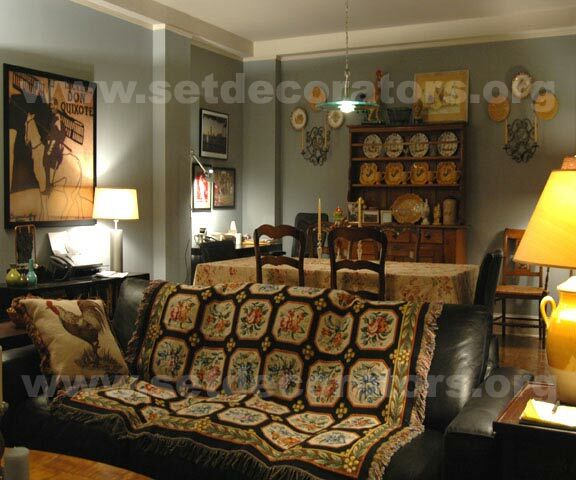 No decorator is a stranger to this situation, as more and more actors’ commitments dictate the daily schedule. It is as much a part of our jobs these days as selecting fabrics and light fixtures. SD: What resources did you rely on most? What new ones did you discover? LR: The most important resource I have is my crew. Assistant Set Decorator Christine Moosher and I have worked together for ten years. Lead Dave Weinman, Set Decorating Coordinator Susan Perlman, Graphics Designer Derick Kardos and Buyer Harriet Zucker are all key players and important members of our set decorating team. 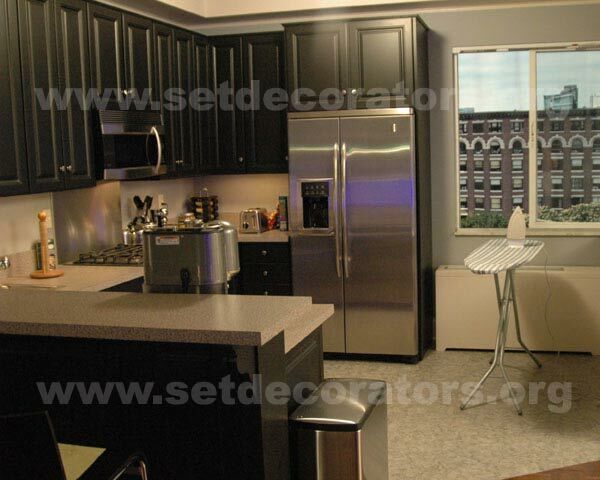 Any set decorator will tell you that it is the crew that makes you look good. I am also so happy to have met and had the opportunity to work with Keira Curcio, my assistant in Boston. Shopper Sophie Carlihan acted as our initial liaison with the MSP during Christine’s first visits. We brought Lead Chris Vogt from New York to work with the Boston set dressing crew. I would not hesitate to work with any of the Boston crew again.